Does investing in cycling facilities return more value in benefits than it costs? The answer is a big fat yes, according to a new analysis from the Department for Transport (DfT). 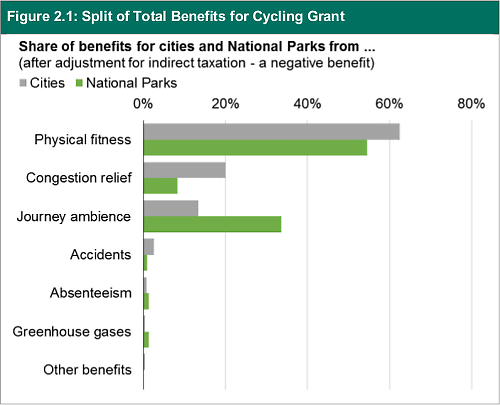 The report summarises the benefit-to-cost ratios (BCR) of a number of schemes planned or underway as a result of funding from Cycle City Ambition Grants and Cycling in National Parks Grants. It found that the return on money spent on cycling varied from just above 2:1 to a whopping 35:1. Not every scheme does that well, of course, but the average benefit is expected to be around £5 for each pound spent. Of the eight cities given a share of the £77 million city grant, Cambridge and Oxford, which have high levels of cycling already, are expected to benefit most with BCRs of 35.5 :1 and 16.5:1. At the other end of the scale, Leeds and Birmingham do rather less well, but they will still return a little over two pounds in benefits for each pound spent. Most of the benefits from the grants - 64% - come from increased physical fitness, as increased activity improves the well-being of both city dwellers and people using parks for recreation. The DfT works out the beneficial effect on health of this spending using the World Health Organisation's HEAT process (health economic assessment tool). The HEAT tool is based on evidence showing that people who are more physically active have a lower rate of premature death when compared to less active individuals. The tool provides a formula to translate increases in cycling or walking (minutes of activity) into a reduction in the individual's risk of premature mortality. And that just takes into account fewer premature deaths. The actual health benefits could be higher still. The DfT says: "This approach … does not account for the benefit of improved health itself (reduced morbidity) to either the individual, their employer or the NHS." In cities, a further 20% of the benefit comes from reduced congestion. Like the overall BCR, this varies widely between cities but the one that stands out is Bristol, which gets over 50% of its 4.1:1 return on spending in congestion. Over all eight cities, each pound spent on cycling returns £1.04 in reduced congestion alone. In its summary, the DfT says the findings "provide further confirmation that targeted investment into cycling can bring very strong returns to society." As cycling campaigner Carlton Reid says over on Bikebiz.com, you then have to ask: "Why isn't the DfT spending even more on cycling and walking infrastructure?" Could Shimano Dura Ace 12-speed be coming soon to a bike near you?